[] AFTER the death of Mahmud in 1030 there were occasional incursions into Hindu territory from Ghazni and the Ghaznavid base at Lahore, but no major territorial change took place, and Hindu India enjoyed a respite from foreign invasion for a century and a half. This did not lead, however, to national consolidation, and a number of principalities grew up in different parts of the subcontinent. 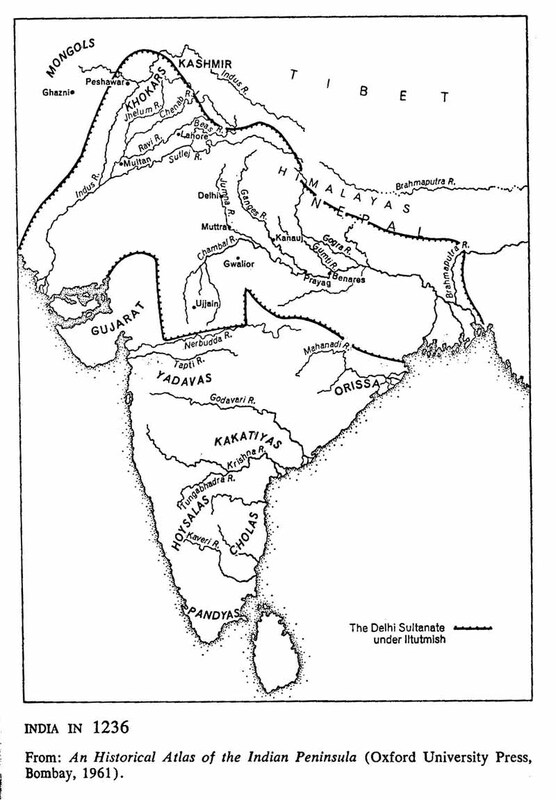 In the north, the most important were the kingdoms of Delhi and Ajmer, Kanauj, Bundhelkhand, Gujarat, Malwa, and Bengal. Occasionally they would come together for some common purpose, but normally there was no cooperation among them, even in the face of the danger that threatened them from the northwest. Perhaps the relative freedom from Muslim raids during the first part of the twelfth century made them forget their perilous position, but, for whatever reason, their disunity made it possible for a determined leader to deal with them one after the other. It was this situation that was exploited to the full by Muhammad Ghuri, who had been placed in charge of Ghazni by his brother, the sultan of Ghur, in 1173. For the next thirty years Ghazni was the base from which Muhammad mounted his attacks on India; unlike the raids of the previous Muslim rulers of the mountain areas, these were aimed not at acquiring plunder and glory but at the political control of northern India. From this time on, the story of Islam in India is one of expansion and the building up of a great empire that would be based not on Ghazni or Ghur but on Lahore and Delhi. To attain his object, Muhammad first had to bring the Muslim kingdoms on the frontier under his control. Soon after the conquest of Ghazni he accomplished this by occupying Multan and Uch in [] 1175. At that time the most frequented route from Ghazni into India was not the well-known Khyber pass, or the Bolan pass in the south, but the Gomal, which leads to the district of Dera Ismail Khan in what is now West Pakistan. Muhammad Ghuri followed this route, and for some years left Peshawar and Lahore undisturbed. After occupying Upper Sind he turned in 1178 to Anhilwara or Patan, the capital of Gujarat, possibly with the hope that its riches would provide an economic basis for his military schemes. He was defeated, however, and had to change his strategy. Turning to the Khyber and the Punjab, he took Peshawar in 1179, Sialkot in 1185, and Lahore in 1186. In the winter of 1190–91 he conquered the Hindu fort of Bhatinda and placed it in charge of a governor. He was returning to Ghazni when he received information that Prithvi Raj of Ajmer and Delhi was on his way to Bhatinda and that immediate help was needed. Part of the sultan's army had already dispersed, but in view of the danger to which Bhatinda was exposed, Muhammad Ghuri returned and met the forces of Prithvi Raj at Tarain (modern Taraori), near Karnal. The Rajputs attacked with such vigor that both wings of the Muslim army were driven from the field. Its center stood firm under Muhammad Ghuri and, in a determined charge on the Hindu center, he attacked Govind Rai, the raja's brother and the commander-in-chief of the Indian army. Muhammad Ghuri struck Govind Rai with a lance, shattering his teeth, but the Hindu general drove his javelin through his opponent's arm. The sultan, faint from pain and loss of blood, was about to fall from his horse when a young Khalji with great presence of mind sprang upon his horse, steadied him, and carried him back to the place where the Muslim army had halted. Here a litter was hastily prepared, and the army returned to Ghazni in comparative order. This was the first major defeat suffered by Muslims in northern India, and on his return to the capital Muhammad Ghuri meted out exemplary punishment to the army chiefs who had fled from the battlefield. As a severe penance for himself, he did not wear fine clothes or engage in any festivities for a year, but concentrated all his energies on preparations for a return to India. The two armies met again in 1192 on the battlefield of Tarain. The [] Indian army far exceeded Muhammad Ghuri's forces in number, but his brilliant generalship and superior tactics gave him a decisive victory. The Indian commander-in-chief fell on the battlefield, Prithvi Raj was captured in the course of flight, and the Indian army was completely routed. This victory made Muhammad Ghuri master of Delhi and Ajmer. He left Qutb-ud-Din Aibak to consolidate the new conquests at Kuhram (in East Punjab), but in conformity with Muhammad ibn Qasim's policy of appointing local governors, a son of Prithvi Raj, was made governor of Ajmer. Prithvi Raj himself was taken to Ajmer, where, after some delay, he was found guilty of treason and executed. A few of his coins with the Sanskrit superscription "Hammira" (Amir) on the obverse have been found, suggesting that he had initially accepted Muslim suzerainty. Muhammad Ghuri, who had returned to Ghazni after the battle of Tarain, was back again two years later to deal with the powerful raja of Kanauj. The ensuing battle was severely contested, but the Muslims were victorious and added a great kingdom to their dominion. Meanwhile, early in 1193, Aibak had occupied Delhi, the future seat of Muslim power in India. Hazabr-ud-din Hasan Adib, an adventurous officer, had conquered Badaun in the heart of the Gangetic plain even before Muhammad Ghuri had taken Bhatinda, and Malik Hisam-ud-din Aghul Bak, another leader of the vanguard of Islam, had established himself in Oudh. These brilliant victories, indicative of the spirit and resourcefulness of early Muslim officers, were soon eclipsed by the exploits of Ikhtiyar-ud-din Muhammad, the son of Bakhtiyar Khalji, who had been assigned certain villages in Oudh. From his advance base between the Ganges and the Son he raided Bihar and Tirhut. His successes attracted so many adventurers that he was able to invade and conquer southern parts of Bihar, probably in 1199. Later he presented himself to Aibak, who gave him his recent conquests as a fief. This encouraged Ikhtiyar-ud-din to extend the Muslim dominion to the most eastern parts of the subcontinent. In 1201 he left Bihar with a large body of horse and marched so rapidly against Nadiya, the capital of Bengal, that when he arrived at the city only eighteen of his companions had been able to keep pace with him. Nadiya was [] partly deserted at this time, and the Muslim commander and his eighteen companions were able to pass through the city gates unchallenged as horse dealers from the north. Reaching the raja's palace on the banks of the Ganges, they cut down the guards, but Raja Lakshmansena escaped through a postern gate by boat. The valiant eighteen held their own until the rest of the army arrived; then took complete control of the capital, laying the foundation of Muslim rule in the northwestern part of Bengal. The raja fled to Vikrampur (near modern Dacca), where his family continued to rule for three generations. After his victory over the raja of Kanauj Muhammad Ghuri was preoccupied with the affairs of Central Asia, as he had succeeded his brother as sultan in 1202. He suffered a defeat in 1205 at the hands of the Qara Khitai Turks, and rumors spread that he had been killed. This led the Khokhars and some other tribes in the Salt Range of the Punjab to rebel, under the leadership of a renegade raja. They defeated the deputy governor of Multan, plundered Lahore, and, by stopping communication between that city and Ghazni, prevented the remittance of revenue from the Punjab. The situation became so serious that it required the sultan's personal attention; and in October, 1205, he left Ghazni for India. Only after the arrival of Aibak with fresh reinforcements was the rebellion completely crushed. Muhammad permitted his troops to return to their homes to prepare for his planned operations in Central Asia, and he himself was returning to Ghazni with a small contingent when on March 15, 1206, he was assassinated near Damiyak, probably by an Ismaili fanatic. The death of Ghuri within fourteen years of the victory at Tarain was a great blow to the rising Muslim power in India, but his task had been nearly accomplished. Nearly all of northern India was under Muslim rule, and in Aibak, Iltutmish, Nasir-ud-din Qabacha, and Muhammad bin Bakhtiyar Khalji, he left a group of capable officers who could complete his task. Many of them, including Aibak and Iltutmish, who later became rulers of India, were slaves, a reminder of the important place well-trained and loyal slaves had in the early Muslim dynasties. Brought from all over Central Asia, often members of ruling families that had been defeated, they provided generals and [] governors who were often more trustworthy than sons or other relatives. The sweeping victories won by Muhammad Ghuri and his generals at the end of the twelfth century tend to give the impression that the conquest of North India was an easy and uninterrupted process. That this was not the case is shown by the reverses suffered by Ghuri himself as well as by the strong counteroffensives mounted by individual Hindu rulers. The most important factor in the success of the Muslims at this time was probably the quality of the rank and file and of their commanders. Not only were Muslim commanders able to wipe out the effects of various setbacks, but they showed superior generalship against heavy odds in victories such as that at Tarain. They were able also to exploit their limited resources to the fullest possible advantage by adopting the most suitable tactics, such as the feigned withdrawal of Ghuri at Tarain and the shock of a sudden surprise at Nadiya by Muhammad bin Bakhtiyar. Another factor which materially contributed to Muslim success was superior horsemanship, and in fact the victories of Muslims over much larger Hindu armies may be considered the victory of the horse over the slow-moving elephant. Other factors also contributed to Muslim success. They were always on the offensive and had the advantage of greater initiative and selectivity. Fighting hundreds of miles away from their homes, they had to fight desperately, as they had no easy means of escape. Religious ardor must also have acted as a spur to their fighting qualities. The soldiers were not confined to one class, as was generally the case with Indian armies, but contained picked and zealous soldiers from all classes and even different ethnic groups, such as the Turks, Tajiks, Khaljis, and Afghans. While these factors were responsible for the speedy conquest of northern India, the consolidation of Muslim rule owed not a little to another event which was a tragedy for the Muslim countries of central and western Asia. This was the Mongol invasion, which drove [] large numbers of refugees, amongst whom were princes, chiefs, soldiers, scholars, and saints, to Muslim India. Thus a vast reservoir of manpower became available to the new government at Delhi, and these people, having suffered so much, did not spare themselves in making India a "Citadel of Islam." After Muhammad Ghuri's assassination in 1206 the control of his Indian possessions passed to his slave Qutb-ud-din Aibak, while the rest of his empire became the scene of a struggle between various claimants for power. This meant, in effect, that henceforth the Indian provinces of the Ghuri dynasty were independent; Aibak may thus be reckoned the first independent Muslim ruler of northern India, the founder of the Delhi Sultanate. He had been bought as a young man by the qazi of Nishapur who, recognizing his ability, gave him a good education. After the qazi's death he was sold to Muhammad Ghuri, under whom he served as a commander, and when Ghuri returned to Ghazni as sultan, Aibak remained as viceroy of his Indian province. In the inevitable confusion that followed the sultan's death, Aibak had himself crowned at Lahore, and although he acknowledged the supremacy of the new ruler at Ghuri, he himself was given the title of sultan, and was virtually independent. A source of perplexity for later jurists in connection with this assumption of power was that Aibak's formal manumission from slavery did not take place until 1208; yet under Islamic law an unmanumitted slave could not be a ruler. In any case, his own successors for the next ninety years were originally either slaves or descendants of slaves. Iltutmish, trained in the traditions of Ghuri and Aibak, moved slowly against his host of enemies. He first consolidated his authority in the areas of Delhi, Badaun, Oudh, and Benares, and then dealt with his Muslim opponents one by one. In 1216 he defeated and captured Yildiz who, after his expulsion from Ghazni by the Khwarizmshahis, had occupied Lahore. In 1225 he turned his attention to Bengal and forced the local ruler to abandon his royal title, acknowledge the authority of Delhi, and pay regular tribute. After this he dealt with Nasir-ud-din Qabacha, the powerful and popular ruler of Sind and western Punjab. On February 9, 1228, he arrived at Uch, Qabacha's capital, and opened siege. Uch surrendered on May 4, and a few days later Qabacha, who had moved to the island fortress of Bhakkar (situated between modern Sukkur and Rohri), found a watery grave in the Indus. An important development of Iltutmish's reign which had indirect but far-reaching consequences for the new empire was the rise of the [] Mongols under Chingiz and Hulagu, and their "dance of death" in central and western Asia. The Mongol invasion, the greatest blow which the Muslim world ever suffered, is the dividing point of Islamic history. The modern evaluation of the Mongol advance as a catastrophe for Islam was shared by contemporaries, one of whom, the historian Ibn-ul-Athir, called it, "the death blow of Islam and the Muslims." Beginning in 1219 with Chingiz Khan's invasion of Transoxiana, it brought destruction to large cultivated areas, ruin to libraries and madrasas, and endless slaughter to men, women, and children. It culminated in the sack of Baghdad, and the end of the Abbasid caliphate at the hands of Hulagu Khan in 1258. A quotation from E. G. Browne summarizes the extent of the catastrophe: "In its suddenness, its devastating destruction, its appalling ferocity, its passionless and purposeless cruelty, its irresistible though short-lived violence, this outburst of savage nomads hitherto hardly known by name even to their neighbors, resembles rather some brute cataclysm of the blind forces of nature than a phenomenon of human history. The details of massacre, outrage, spoliation, and destruction wrought by these hateful hordes of barbarians who, in the space of a few years, swept the world from Japan to Germany would … be incredible were they not confirmed from so many different quarters. "/2/ That India was spared the full force of invasion can be attributed in large part to the vigilance and resourcefulness of the Delhi sultans. Iltutmish rivals Balban for the distinction of being the greatest of the Slave Kings. Although it was Balban's transformation of the royal position that became firmly ingrained in the fabric of Muslim government, Iltutmish's work was historically of great importance. Aibak had done little but maintain the position he had acquired from Ghuri; it was Iltutmish who consolidated the Indian possessions into an independent kingdom. Not only had he to deal with powerful Muslim rivals and the Hindu counter-offensive, but he also had to build up the fabric of a new administration and organize different departments of the central government at Delhi. A skillful organizer, he dealt with the problems of administration in the same manner that he handled threats to the security and the integrity of the realm. In this his task was greatly facilitated by the model of government organization that had been established at Ghazni and the copious literature that had appeared on statecraft and the art of government in [] Muslim countries. By now some of the classics of Muslim political theory, such as the Arabic Ahkam-us-Sultania, the Persian Qabus Namah (1082), and the Siasat Nama (1092) had already been written, in addition to similar works that have perished. The historian Ziya-ud-din Barani (1285–1357) quotes Balban as speaking of two works on statecraft—Adab-us-Salatin and Maasir-us-Salatin—which were brought from Baghdad in Iltutmish's reign./4/ He also seems to have received assistance from scholars versed in the principles of Muslim political theory and governmental organization, and Adab-ul-Muluk, the first Indo-Muslim classic on the art of government and warfare was written for him. With this background, he was able to lay the basis of a well-coordinated structure of government. [] nobles. He tried to maintain a balance between the Turks, who were the all-powerful generals and governors, and the Persian-speaking Tajiks, who provided the scribes who dominated the imperial secretariat. After his death the balance was seriously upset, but by then the basic task of organizing the new Muslim government had been accomplished. Iltutmish took other steps to strengthen the fabric of the new government. To give it a legal basis in the eyes of the orthodox, he is said to have sought confirmation of his royal title from the Abbasid caliph of Baghdad. On February 19, 1229, the caliph's envoy arrived with a robe of honor and delivered to Iltutmish a patent which conveyed recognition of his title as the sultan of India. The caliph's recognition was largely a formality, and this seems to be one of the two occasions when a ruler of Delhi troubled himself about obtaining foreign recognition, but in the initial stages of Muslim rule this step was useful. It confirmed the sovereignty of Delhi against the claims of [] Ghazni, giving it a legal basis in the eyes of the orthodox, and it also silenced those local rivals who challenged the sultan's authority. After this investiture, Iltutmish attended to the coinage, an important symbol of sovereignty. The name of the caliph was inscribed on the coins issued from the royal mint, and the sultan was described as "Helper of the Commander of the Faithful." So far the Muslim rulers had issued small bullion coins of the native form inscribed in Devanagari, the Indian script, or in Arabic characters, and bearing symbols familiar to the Hindu population such as the Bull of Shiva and the Chauhan horseman. Iltutmish now introduced purely Arabic coinage, discarding Hindu symbols, and adopted as a standard coin the silver tanka, the ancestor of the modern rupee. While Iltutmish's outlook and political philosophy were reflected in the salient features of his administration, he was fortunate in receiving competent assistance and guidance from some able and farsighted people. Principal amongst these co-workers was his wazir, Nizam-ul-Mulk Kamal-ud-din Muhammad Junaidi, a man of culture, a distinguished patron of learning, and a statesman of strong views. The historian Aufi dedicated his famous Jawami-al-Hikayat to him, and in a number of verses and poems interspersed in the book he praised Junaidi's wisdom, statesmanship, skill in warfare, and generosity. The contemporary poet Reza also wrote many poems extolling these qualities of Junaidi and has mentioned as well his calligraphy [] and excellent literary style. Isami also praises him in his history, Futuh-us-Salatin, mentioning that it was Junaidi who had purchased Balban as a present for Iltutmish. Junaidi's strength of character may be seen from the fact that when Iltutmish's worthless son, Rukn-ud-din Firuz, began to squander public money after his father's death, the wazir risked his office and refused to support him. He also refused to take the oath of allegiance to Raziyya, who had ascended the throne without consultation with the provincial chiefs and the wazir. The most fruitful part of Junaidi's career was under Iltutmish, when he was in charge of the entire government, including civil and military departments, and even religious functions which were later entrusted to the sadr-i-jahan. Barani's account of the conference which was convened to determine the treatment of the Hindus shows that in such major political issues Junaidi's opinion counted for much. He advocated a humane line of action, and though he based his viewpoint on the grounds of expediency, he achieved the practical end he had in view. The prominent role which he played in dealing with this difficult and crucial question would suggest that he had an equally important part in the formulation of other decisions and actions of Iltutmish's government. The problem of a successor troubled Iltutmish during his last days. His eldest son had died, and his other sons were worthless; his own choice was his able daughter Raziyya, but he knew the Turkish nobles were opposed to the idea of a woman ruler. He tried various solutions to deal with the situation. When he set out for Gwalior in 1231, he left Raziyya in charge of the capital, and was so satisfied with her handling of government affairs during his long absence that on his return he considered issuing a proclamation appointing her his heir. Her name was included along with that of the sultan in a series of coins, but for one reason or another Iltutmish did not take the final step of naming her his successor. He entrusted the viceroyalty of Lahore to his eldest surviving son, Rukn-ud-din Firuz, to see how he fared. Before he could decide the question of succession, [] Iltutmish fell seriously ill and the matter was still unsettled when he died. Firuz ascended the throne with the support of army leaders, but he started squandering public funds and misusing power in such a way that the provincial governors revolted. Firuz left the capital to deal with the rebels when one of the most gruesome tragedies of early Muslim rule took place. Firuz's misbehavior and the high-handedness of his mother Shah Turkan had offended so many people that even the Wazir Nizam-ul-Mulk Junaidi left the sultan to join his opponents. This brought to a head the bitter antagonism that existed between two court factions, the Tajiks and the Turks. The Tajiks were Persian-speaking Turks who had migrated from Turkish homelands. Their contribution to the building of the early Muslim state at Delhi was very substantial, and not only did they monopolize the higher posts in the Delhi secretariat, but also they dominated the literary and intellectual life. The wazir himself was a Tajik. So was Minhaj-us-Siraj, the historian and the future chief justice. Along with other notables they were openly hostile to Firuz. This so enraged the sultan's Turkish supporters that they massacred all the Tajik notables who were present in the royal camp. The list of casualties preserved by Minhaj-us-Siraj reads like a roll-call of the Delhi court./8/ Practically all the leading literary figures of Iltutmish's reign were extinguished on one dark day. The tragedy damaged irreparably the influence of the Tajiks and also impoverished the intellectual life of the new state. While Rukn-ud-din Firuz's supporters were destroying the flower of the imperial secretariat, his sister Raziyya made a bold bid for the throne. Clad in red, she appeared before the people gathered for Friday prayers in the principal mosque at Delhi and appealed to them in the name of Iltutmish to give her a chance to prove her worth. This dramatic gesture evoked great response, and the people of Delhi, who so far had not taken the oath of allegiance to Firuz, accepted her claim. On his return, Firuz was imprisoned and subsequently put to death, but Rizayya's accession, which had been effected without consent of the provincial governors or even of the wazir, was doomed from the beginning. For the powerful nobles considered her accession [] was unprecedented; her discarding of the veil and her severity swung public opinion against her. She tried to create dissension among her opponents, but the elevation of an Abyssinian to the major post of amir-i-akhur (commander of the cavalry) gave serious offense to the Turkish nobles and they rose in rebellion against her. Her followers murdered the Abyssinian and imprisoned her while she was camping at Bhatinda to deal with the rebels. Her efforts to weather the storm by marrying Altuniya, the rebel governor of Bhatinda, failed to save her. Her brother Bahram, who had been proclaimed sultan of Delhi during her absence, entrusted young Balban, their father's slave, with the task of dealing with Raziyya and her husband's troops, and Balban carried out the mission with the competence which was, in course of time, to carry him to the throne of Delhi. Raziyya and Altuniya were defeated, deserted by their troops, and murdered by the Hindus in the course of their lonely flight (October 14, 1240). Raziyya's brief reign also saw a bid for power by the Ismailis, a heretical sect which once had sought to assassinate Iltutmish. On Friday, March 5, 1237, nearly a thousand of them, incited by the harangues of a fanatical preacher, Nur Turk, entered the great mosque of Delhi from two directions and attacked the congregation. Many fell under their swords, but the Turkish nobles assembled their troops who, aided by the congregation, overpowered and slaughtered the insurgents. Raziyya's end highlighted a development which, though visible even in the success of nobles in sponsoring the claims of Iltutmish against those of Qutb-ud-din, Aibak's son, had become more marked since the death of Iltutmish. This was the question of the right and power of the nobility to determine the choice of the sultan and place limitations on his power and sphere of activity. After Raziyya was defeated and imprisoned, her half-brother Muizz-ud-din Bahram was proclaimed sultan, but "on the stipulation of Deputyship being conferred on Malik Ikhtiyar-ud-din Aetkin," who "by virtue of his Deputyship … took the affairs of the kingdom into his own hands, [] and, in conjunction with the wazir [Muhazzab-ud-din] … and Muhammad Iwaz, the mustaufi [the auditor-general] assumed control over the disposal of state affairs. "/9/ There is an analogy in this action to that taken in the same century by King John's barons in England, but the arrangement at Delhi broke down at once. The basic responsibility for the failure was that of the deputy who, as the nominee of the nobles, started assuming royal prerogatives, and took steps which alarmed the new monarch. He married the sultan's sister, assumed the triple naubat, the drums which were a symbol of sovereignty, and stationed an elephant at the entrance of his residence. These developments annoyed the youthful monarch, and he secretly encouraged violent measures to deal with the situation. Within three months of his assumption of office, the deputy was assassinated in the royal presence at a gathering arranged to hear a sermon. The wazir was also attacked by the assassins but managed to escape. This was not the end of the struggle between the nobles and the sultan. Badrud-din-Sunqar, the amir-i-hajib (lord chamberlain) assumed the direction of state affairs, but he suffered from the sultan's hostility and lack of cooperation from the wazir. He called a meeting of the principal nobles, including the highest financial and judicial officials of the realm. They discussed recent events among themselves and sent the mushrif-i-mumalik (accountant-general) to invite the wazir to join them. The wazir promised to come, but instead conveyed the news of what was happening to the sultan. Bahram immediately mounted his horse and reached the place where the meeting was being held. He took Sunqar with him, but so strong was the power of the nobles that no real punishment was inflicted on the leader of the conspiracy. He was sent to Badaun, which was given to him as a fief. Qazi Jalal-ud-din was relieved of the office of the chief qazi (which was a few weeks later conferred on Minhaj-us-Siraj), and some of the other collaborators left the capital, fearing unpleasant developments. The wazir now became all-powerful, but the attack had shown Bahram's real sentiments toward him. He soon joined hands with the nobles to depose Bahram, who was dethroned on May 10, 1242. The principal senior noble, Izz-ud-din Kishlu Khan, now made a bid for the [] throne, but his associates repudiated him, choosing instead Iltutmish's grandson, Ala-ud-din Masud. Qutb-ud-din Husain of Ghur was named deputy, but the real power remained with the wazir. The Turkish amirs, the soldier-administrators of the realm, did not like the concentration of power in the hands of someone selected from the "writer" class, so they joined forces and had him assassinated. The submissive Najm-ud-din Abu Bakr now became wazir, and Balban, Iltutmish's slave, was appointed to the key post of Amir-i-Hajib. Ala-ud-din Masud continued to rule for more than four years with tolerable success, but later when he tried to curb the power of the nobles he alienated the most powerful of them. He was deposed on June 10, 1246, and the nobles, among whom Balban played a dominant role, enthroned Iltutmish's youngest son, Nasir-ud-din Mahmud. /1/ Minhaj-us-Siraj, Tabaqat-i-Nasiri, trans. by H. G. Raverty (Calcutta, 1881), I, 628–29. /2/ E. G. Browne, A Literary History of Persia (Cambridge, 1928), II, 427. /3/ H. M. Elliot and John Dowson, The History of India as Told by Her Own Historians (London, 1867–1877), III, 98–99. /4/ Ziya-ud-din Barani, Tarikh-i-Firuz Shahi, ed. by S. A. Khan (Calcutta, 1862), pp. 144–45. /6/ S. A. Rashid in Medieval Indian Quarterly, Vol. I, No. 3 and 4, pp. 104–5. /7/ U. N. Day, The Administrative System of the Delhi Sultanate (Allahabad, 1959), p. 160.